Looking for Pentax SMC yellow filters for a 35mm b&w photography project, ideally 49mm and 52mm. Not overly concerned whether they come in boxes or cases, as long as not scratched! Please PM if you have any of these filters that you'd like to sell. Best source would probably to ask a second hand camera shop where they're likely to have a box full to sort through. Nothing wrong with Hoya ones! Just a personal preference for Pentax SMC ones. I've got both Hoya and Pentax SMC skylight filters and 'for some reason' prefer the Pentax ones. Not really based on any logical reason - they feel heavier and (to me) look better with my Pentax glass. Pentax SMC filters seem harder to find and if I can't get any, I'll get Hoya. Yes I've seen that, I'm based in the UK so unfortunately that one is too much to ship! Thanks for your help. 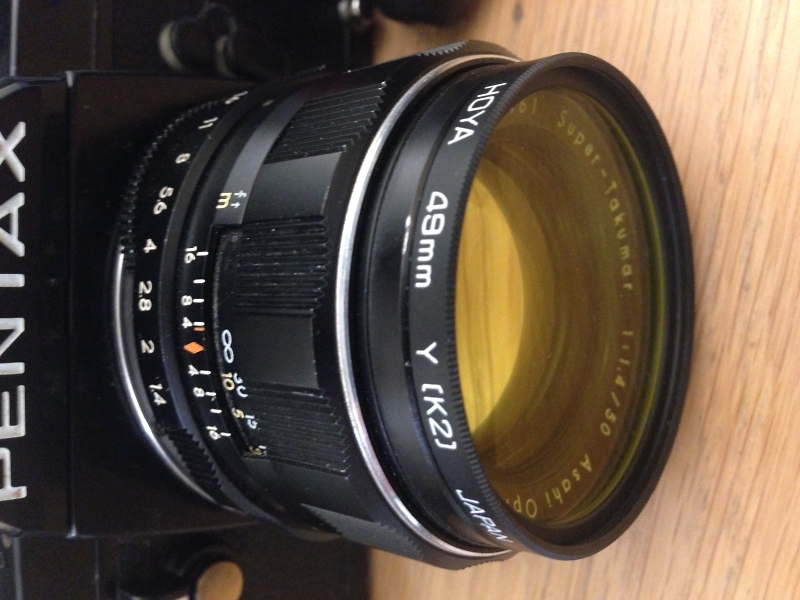 I have a Hoya 49mm Y [k2] filter. I will never use. Your welcome to it , if its of any use to your project ? Do you just need yellow or do you need any others? In 52mm. Y2, O2 and R2. These are the SMC versions, Should have the cases somewhere and maybe even the boxes for the 52mm filters. Quick update: Stub has got his 49mm Hoya K2 in the post to me and very kindly he's given and sent it free of charge! Thank you again, very generous of you. What an amazing community! Looking forward to getting it on my Super Tak! @Kim - thank you very much for your response, I've PM'd you. @stub - arrived today, thank you so much! Really, really appreciate it. Can't wait to see the results. Thank you! 49mm isnt a lot of use on the new full frame lenses....!! Dont think my ME Super will ever see daylight again never mind a film. Good luck with the studies.. Post some results..